Yep great race. If Marquez wouldn’t have crashed he would have gotten at least 2nd. Rins is a great rider and the Zook is improving, they need some more power and they will be at the front every week. In MotoGP, where the only rule is that the bikes can't have any production parts... That proves how good a stock RMZ is though, lol. why am I reading this? ..... Oh christ, now I'm posting...... shiiiiiiiit!! Bummed for Rossi...was looking forward to his celebration, having said that, I'm really Rins got his first win. Suzuki are doing a good job on a way smaller budget than most of those teams. Extremely rewarding for them. Suzuki makes a great MX bike as well. More capable than 99.9% of the population can ride it. Bullet proof, fairly priced...can't beat it. It wasn’t long ago that Suzuki was finishing dead last consistently. They were getting beat by satellite teams every race. 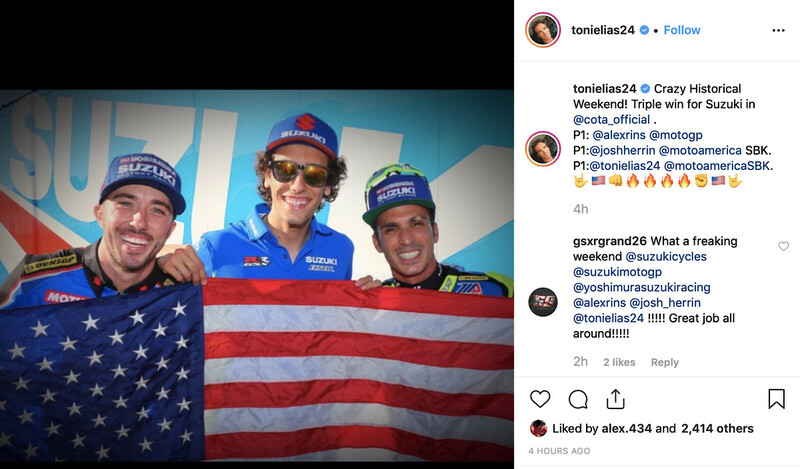 They’ve come a long way with their MotoGP program. The brand hasn't exactly been killing it in the marketing and sales department. Since like 75% or more of the MX population are not capable of using a bike to it's potential anyway i would expect to see Suzuki being used by the majority of the hobby/recreational racers. But on a typical weekend day i probably see <10% Suzuki's at the local track. I guess their sales and marketing team has something to do with that. Suzuki got 3 wins at COTA. Extremely happy campers over at the big blue S.
I've said it before but Suzuki if they want to find a niche is to push forward with their 4 strokes and get a hydraulic clutch and e-start, re-introduce their awesome 125 and 250 two strokes from the past and value price them plus build a 350 four stroke. As for hiring race winning riders for marketing? F that. Go back to sponsoring many many privateer riders like they used to.